Out of approximately 500,000 estimated yearly deaths from cancer in the United States, evidence suggests that one-third may be attributed to lifestyle habits related to diet and physical activity including obesity. (“American Cancer Society guidelines on nutrition and physical activity for cancer prevention”, 2012) Fitness professionals need to be aware of both the benefits of exercise and the consequences of physical inactivity. Cancer is a very serious diagnosis with a multifaceted approach starting from identification all the way through treatment.As a health-fitness professional, all aspects need to be considered when creating a safe and effective exercise program. Consulting the treatment team for exercise clearance and recommendations sets the building blocks for success. Each curriculum should be individualized and based on treatment, fatigue, possible physical challenges, previous exercise experience and acceptance. Exercise agenda may vary daily and you need to incorporate empathy and flexibility to encourage small achievements to long-term goals.This course includes basic information about cancer and exercise guidelines. Videos guide you through a simple exercise progression for clients with cancer or who are cancer survivors. In the search for a cure, physical activity proves a valuable tool in prevention, treatment and a progressive return to daily living activities. Review cancer facts, types, stages, risk factors, and causes. Learn the role exercise plays in prevention, progression, and rehabilitation of cancer. Understand how diet and physical activity can play a role in all aspects of cancer. Understand treatments used in the cancer process. Review exercise contraindications and special considerations. Learn basic exercise guidelines for cardiorespiratory, resistance, and flexibility training for clients with cancer or recovering from cancer. 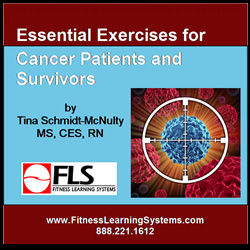 Learn several levels of basic resistance training exercises to be used for clients in various stages of the cancer process.